Swing Cards for an added surprise to your cards. ...for an added surprise to your cards. Swing cards are sure to give your recipients a lovely surprise when they open your card. Another card with movement that is easy to produce, and that adds interest to your projects. This is sure to delight any person that receives one of these from you. 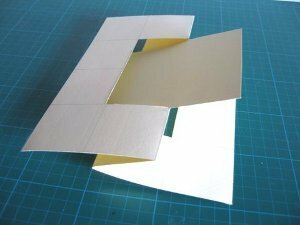 It is easy to achieve and I have used nothing other than a cutting mat for the dimensions. If you make your template first with some cheap card, you will be able to keep this for future reference whenever you want to produce swing cards again. This is an A4 card and I have lined it up on my cutting mat so that it fits in with all the thicker lines on the mat. As this is my template I have used bold lines so that you can see the markings. 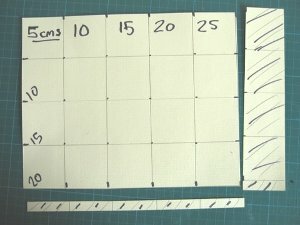 I have marked the card at 5cms intervals. The shaded part of the card is surplus and can be cut off. When this is done you will be left with a card is 25cms wide by 20cms deep. 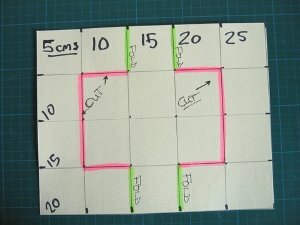 The area you will need to cut is marked in pink, and the green lines are where the card will be scored and folded. We are now ready to do the folding. 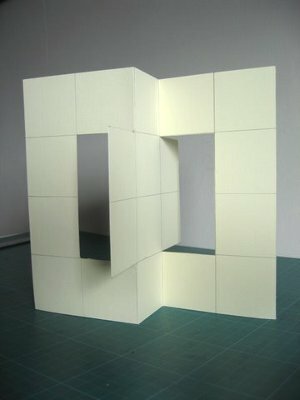 Take the left score line and fold it backwards, and take the right one and fold it forwards. 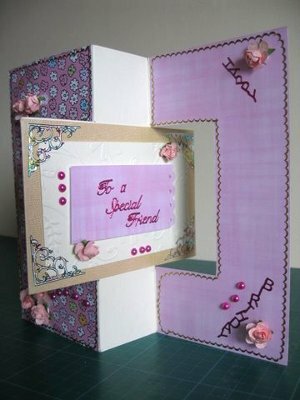 The centre part is now the swing element to your card and it should look like the photograph when you have finished. Your good card will not have all the marks on it, this is only the dummy run. But once you have this template it's there for all time. 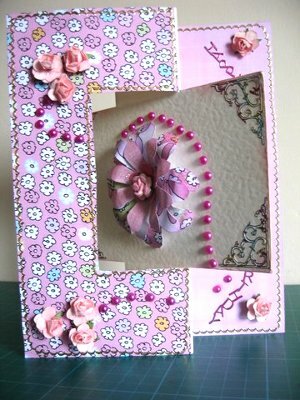 Any panels you may wish to make to add to your swing cards can also be cut from this template. The card is now ready for you to embellish in any way you want to. I have added patterned papers and handmade paper flowers to the front of mine, along with flat backed pearls and some peel off sentiments. I have used a pen to colour the peel off to match my card. Don't forget to decorate the reverse side too, as this is the surprise element to your finished card. to the back of the card.